jetzt fängt die Zeit für Mantel und Stricksachen wieder an, deshalb zeige ich euch heute mal ein paar meiner Favoriten für Herbst und Winter. Besonders toll finde ich momentan diese längeren Mäntel im Blazer-Stil. Besonders der beigefarbene hat es mir angetan. Auch grobe Strickjacken mit Blusen darunter sind mein Must-Have für den Herbst. I like the wool coat and green dress nice selection. Great selection! number 3 is my favourite! Great pieces, really love the caramel coloured coat! Kiss and have a great week ! 1 and 4are my favorites!!! So romantic!! Love the first two coats. Oh thank you for your comment on my blog! I like number 3 and 6. I could combine!!! Thanks for stopping by my blog! I like the blue cardigan and the green dress. Nice post! Very Very beautiful items! Amazing blog you have! I love all of your picks for this post! You have a great sense of style and a beautiful blog! Great post! 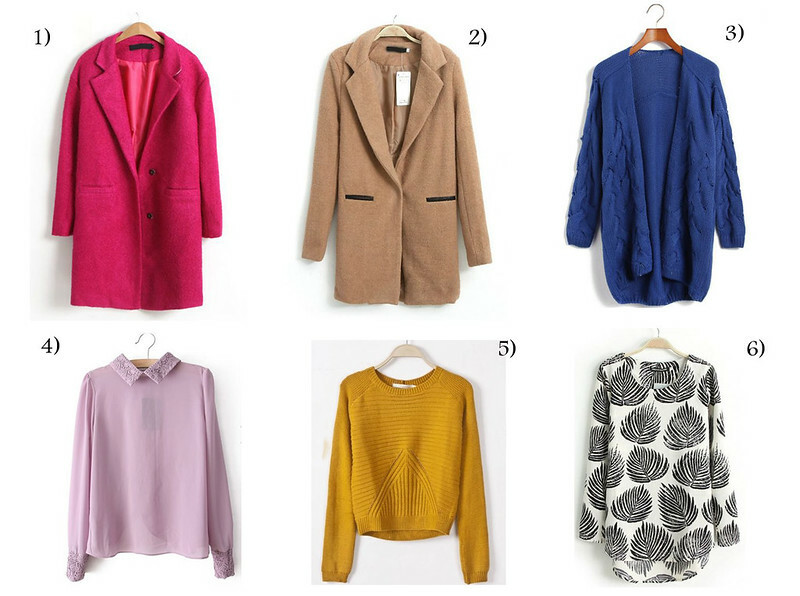 My favs are the oversize coats (what lovely colours!) and the yellow sweater, so perfect for fall and winter! Such a lovely selection!!! Love them all! Love it and love your blog as well! OMG!! so in love with the mustard sweater!!! all great stuff! I'm looking for a coat this days! Lovely picks! That rose red coat is my favorite for sure! werde dir jetzt folgen. wenn du magst, kannst du mir natürlich auch folgen, sofern du dich für meine Posts begeistern kannst :) ich würde mich freuen! come back soon to visit me..new post ! Love the pink coat and the green dress! They all beautiful, but the green dress is fab and perfect for my shape!! I like all but 3-6-8 are my favourites. They are all really nice but my favourite is the Camel Wool Coat :) it's gorgeous!! I love your sélections ! Sehr schöne Teile, ich mag vor allem die beiden Mäntel! I need number 1 haha! Great selections. I really like the rose red coat and the pink blouse. Your blog is super cute. Coat n. 1 is amazing ! Love the color ! I don't know if I said it, but about your post, I like the pink coat and the green dress! I am going gaga over that green dress. Thank you so much for your kind words on my blog! Also ich finde echt alles toll, besonders vielleicht den roten Mantel! In love with the first coat!